I wonder why I write race reports, I suppose it is usually more for myself than it is for potential readers, as souvenirs I will keep, like my medals. But this time, there is also something that I would like to share, something I had the privilege to discover by being now closer to the front of the field: race dynamics. I read last month Macca’s book “I Am Here To Win” and it taught me to really think about my race. How can I improve versus the last time without being in a significantly better shape? I started to discuss with Isa, weighting different options and finally settling for the following one: I decided to start at the very front of swim but at the farthest possible from the ideal line and swim easy, not because I wanted to save energy for the bike or for run, but because I made the bet that the better age group bikers are usually not the best swimmers. And if I could start riding with a group of strong bikers I would be much more likely to be faster than racing on my own. For the bike leg, I had asked Isabel to position herself with my friends just in front of the hotel to cheer me on, as it was a place where I could see them 5 times and that would give me 5 additional boosts of energy. I also decided, based on the experience of last year on the same course, that I would give myself time in the first 2000m of the run to adjust from the horizontal to the vertical position and make sure that I was “all systems go” before increasing the pace and try to finally go under1:40 for the half marathon. I also realised that Isabel, who did her first triathlon the day before was out of transition faster then I usually would (I know…it is somewhat embarrassing after 5 years in the sport) and told myself that I was really trotting too slow in T1 and T2. So, this time I would sprint through transition. So, This was the plan. At 12:15, I kiss Isabel good-bye after a quick warm-up and I swim my way up to the starting line. 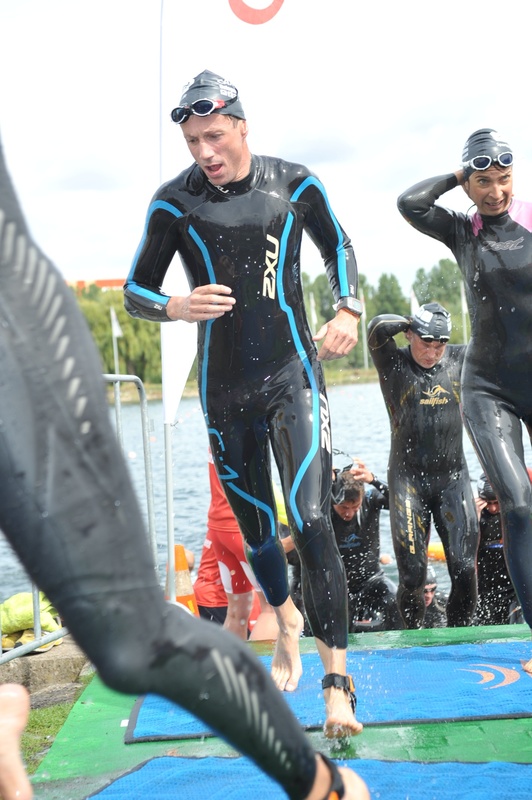 I love the start of the 1.9km swim in Cologne at the Fühlingersee. This rowing basin is used as a drinking water reservoir for the city. The water is clean, clear, smooth. There are buoys every 15m. so you just need to position yourself at the start along one of the 8 rowing corridors and get ready for a straight swim. I decide to go at the farthest right, to stay away from powerful swimmers. I also know, that is the spot were the weaker swimmers will go. I am therefore able to position myself right at the front of the pack. The gun goes off. There are 3 waves of starters. The first wave with number from 1000 to 1070 (the pro + elite age groupers), then a second wave from 1071 to 1650 and finally the last wave from 1651 to 2200. The bikes are racked according to the numbers and the numbers are allocated by ascending predicted times. My number was 1101, so 30 atheletes had predicted in the second wave a faster total race time than me and 550 a slower time. From the previous races I did, I noticed that bikes did not exit in this expected sequential order. I always saw triathletes spread in the transition zone. It became clear to me, that there was no logical link between a fast swim and a fast overall predicted race time for age groupers. My bet, as said was that I would be more likely to meet in T1 good bikers with similar bib numbers, if I would swim easy. And, at least for this race…I WAS RIGHT!! I saw plenty of fellow competitors left and right getting ready to push mostly beautiful bikes with disc wheels out of transition. I told to myself this was the chance to ride with a great bunch. 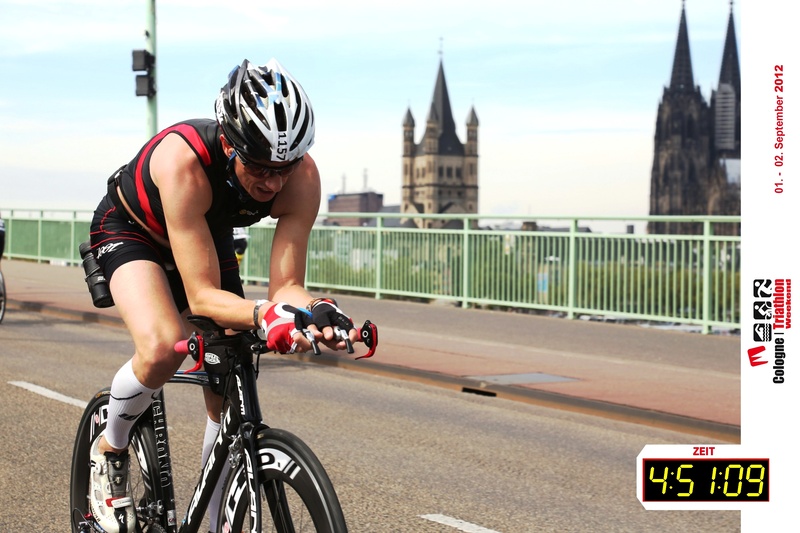 We have tail wind for the first 15km towards the city centre of Cologne. The group is moving fast in an orderly manner. At the point, where I expect to see Isa and the Goldberg family, I see nobody. That surprises me a bit but I think, I would see them when I ride bike out of town. I look at my Garmin and see average speed 39.2 km/h. Ooopla. Even with the wind in our back, this was fast. First turn of the 2 loop course and out of the city. Again, nobody to support…hm..As soon as we exit the city the 15 km/h wind hits us in the face and within 2 min the train becomes a pack. Race referees on their motor bikes appear from everywhere and start shouting to keep distance and make passes. It was clear to me, that staying in this situation would only get me a yellow card and 4 minutes penalty. Afterall, living on the coast of the Netherlands with the constant winds, should be an advantage for me now. So I decide to attack. I pass the pack in less than a minute and push the pace. I look behind and nobody is following me. Bummer. While I look back, I see that I have lost my spare kit. Double bummer. If I have a flat now the race is over. Anyways, my quads are on fire and I start to wonder how the hell I will run after this. The roads slowly changes direction after 10K, I am in cross-winds and decide to let off the pace for a few minutes. The stronger bikers of the group join me and we decide to race together. The remaining bikers had obviously more issues with the headwind. And from then on, I had a great time. We were riding clean, respecting the minimum distance. It took me a while to understand why the race marshalls were constantly on us, but then a light bulb went on: The first wave with the elite athletes started 10 minutes ahead, so no surprise, that I was seeing bikers riding in the opposite direction on this loop course. But fact was that WE were the leading train of the second wave and that special attention was given to us by the referrees. I was so excited, I was picturing myself on the Queen K highway in Hawaii with an helicopter on top of my head. I had a great time. We enter for the 2nd time the city and this time, the support team is there. They are screaming words that I do not undestand and I shout back raising a fist “CHAAAARGE!! !” and take the lead of the train at more the 42 km/h. We make the turn in the city and knowing that Isa and the crew would be there screaming like histerics in a few seconds I put the hammer down and ride on their energy past them. On the last 20km I distance the lead pack by 3 minutes. I finish the 90km bike leg in 2:25, 66th fastest split of the day and dash through transition in barely 1:30. As planned, I force myself to slowdown on the first 2000m, and again, I see that I had taken the right decision. Like last year, my liver starts to send large pain signals. But this time, I know what this means. I stop at the first aid station and drink about 500ml of Coke. The pain disappears quasi instantly. The problem is: the Coke is not degassed. So the liver pain changes into stomach pain, but I can handle stomach pain. With liver pain the worst that can happen is ending on a stretcher, with stomach pain the worst that can happen is shitting my pants, so just an ego issue, really. I see the smiling faces of Nicki, Isabel, Joel, Aaron and their kids. I know I would never have been able to race that hard without them and feel thanksful for their presence. I was also happy to have taken certain dynamics of the race at my advantage to beat my old personal best by over 11 minutes. This was the last race of the season I had wished for. I am now looking forward to a long break from triathlon. Swim: 34:06 (224), Bike: 2:25 (62), Run 1:36:14 (82). Total 4:40:55. 11th in AG40-44 and 70th overall. 2. 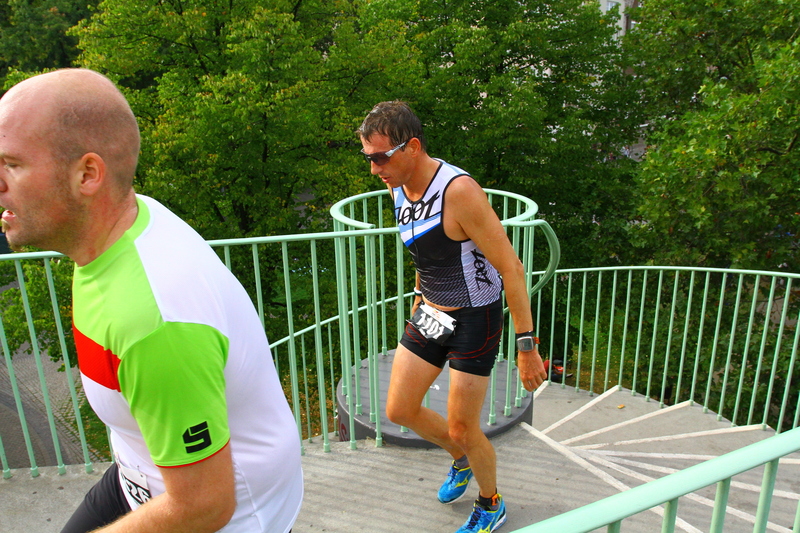 Improve my ranking at the Wassenaarse ZwemLoop (Aug), a 1km Swim, 10km run at the local beach – done! moving from rank 18 to rank 4 and retaining my title as Fastest Wassenaarian. The only title I will probably ever hold. 3. 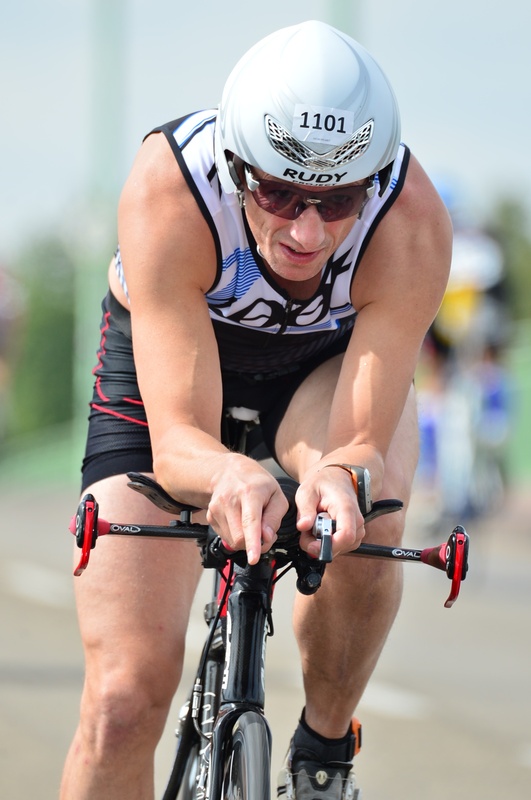 PR at the Olympic Triathlon distance (July) (1.5 Swim, 40k Bike, 10k run). Done! by 9min at the Olympic Triathlon in Friesland, The Netherlands with a great time for me of 2:21, and this in very strong wind conditions. I travelled on Sept 2nd to Cologne for the race and slept at my cousin’s place in Bonn. 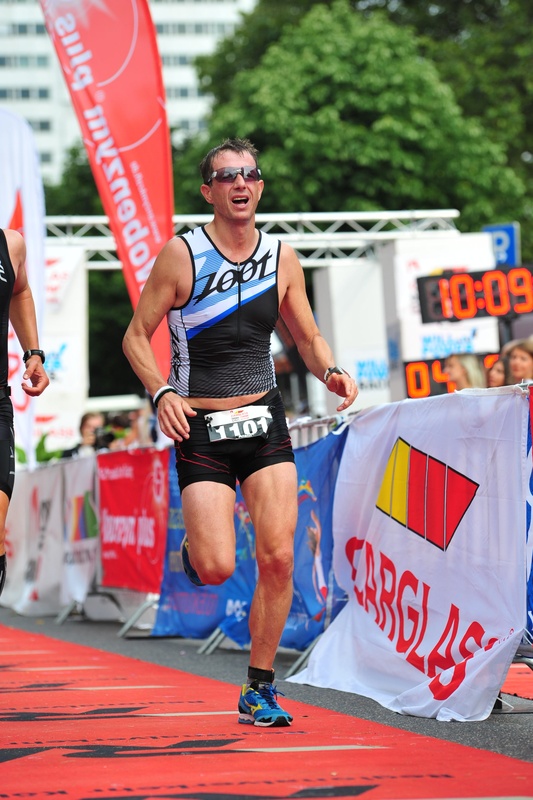 She and her husband are dedicated to the sport of triathlon in general and Ironman in particular. 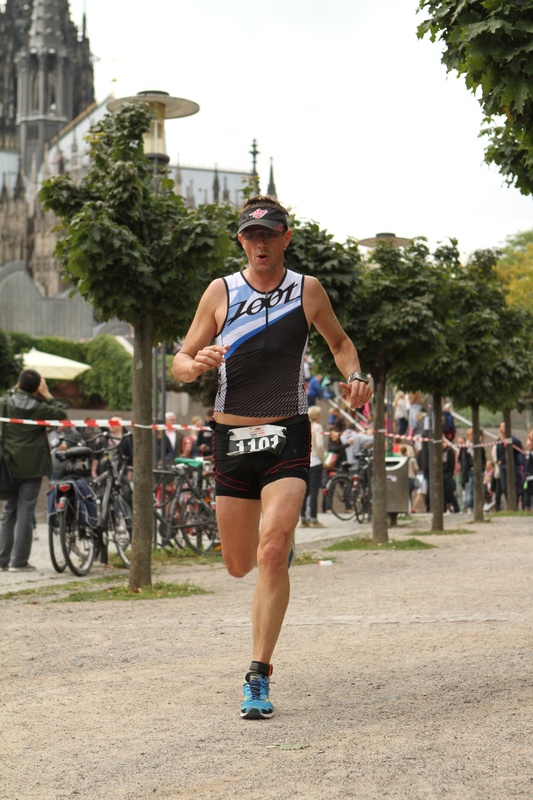 Just to mention the level of my female cousin (42), she beated my at the half Ironman in Kraichgau (Germany) in 2011 by 32 min…. but it is great to spend some time with them. I learn a lot and they will always give me some useful tips as well as diagnose 1 or 2 things for which I have a blind spot. I had a great sleep. Never had such a good sleep before a race. It actually worried me whether I was really motivated. But Isa, my cousin, told me, sleep is the best doping there is in town. Go and race hard. 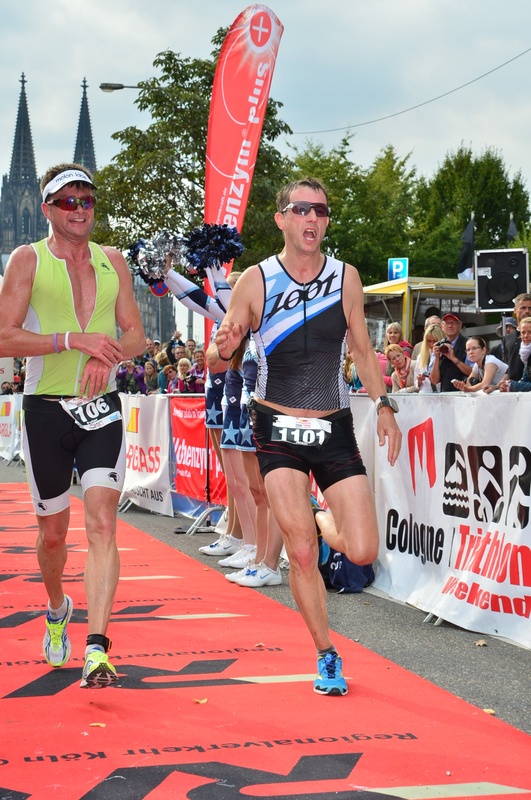 So I travelled to Cologne to meet first with a friend that would race with me and together we went to pick-up our starting packs and rack our bikes next to each other in the transition zone. The gun went off at 12:30. Quite late for a half distance (1.9km Swim, 90km bike, 21.1km run), but it was great weather and water temp was just below 21. Perfect. I took it really easy with a 17:30 pace, found “good feet” to slipstream and let myself drag during the whole course. 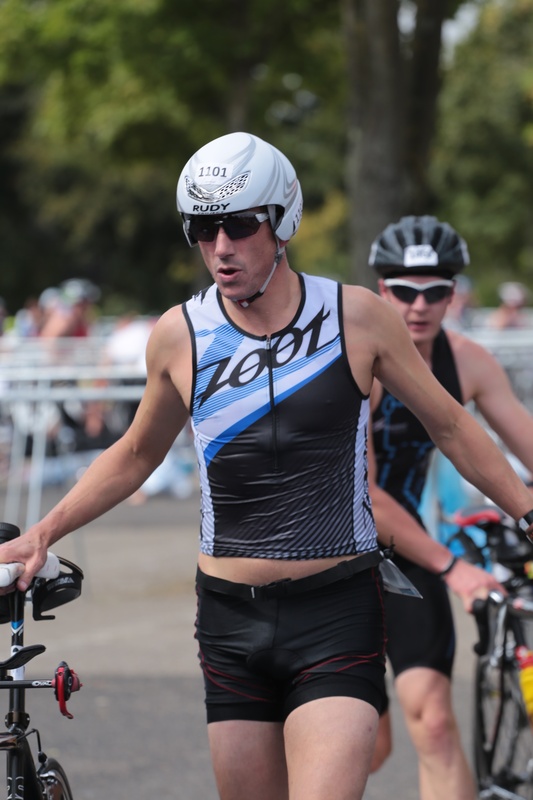 At my last Olympic distance I took a 15:00 pace but it was too fast and came panting out of the water needing a few km on the bike to recover…. To my surprise, when arriving at my bike, I see my friend already there. He was not supposed to be that fit!!! so I hurry up and leave transition 30 sec before him. The bike leg came with perfect weather conditions and only a 6kmh breeze. Great marshalling on the course to prevent drafting on this non-drafting course. All packs were immediately broken up. I have never seen so many yellow cards (even saw one black! -disqualified). The result list shows 40 yellow cards, meaning 40 people where warned of drafting and got a penalty of 4min! I wanted a negative split (riding the second half faster than the first), but it did not happen. I was enjoying this thing too much, riding at 36kmh on average. Still, I did not go all out and kept enough in the tank for the run. Very happy with the bike improvement over the last months. 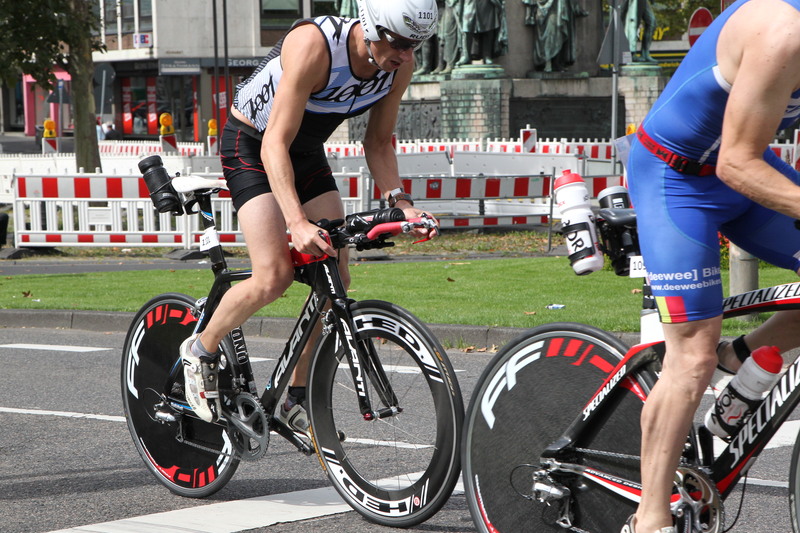 I wonder what pace I could have gone with a disc and an aero helmet…. Will I be going back to the triathlon candy store soon? Anyway..it took me exactly 2:30 to transition number 2! I started the run with surprisingly fresh legs, no jelly feeling. I paced and felt really strong. After 2km I knew 4:45 total time was in the bag and I was pumped and thrilled, but at km 4 horrible pain in the liver area! I discovered later tthis typical pain kicking-in is due to lack of sugar. I had to reduce speed as the pain was too horrible when going under 5 min pace. It is so frustrating to have great legs but somehow the body says NO and you see your time flying away without being able to do anything. Finally, at km 10, I took some Coke and from then on the engine restarted and I knew what I had to take at every aid station. I finished strong the last 11km nearly 5min under the first half. Unwanted neg.splits….Very disappointed with the run. A 1:37 would have been easily feasible, instead I have to live with a 1:42. I saw my friend on the run course about 5km behind me. He had a great finish for his first Half-distance of 5:09. I finished in 4:51:02, 27th AG40-44 in the first 25% and 144/830 overall. Good lessons learnt for the upcoming Ironman in 2 months but need to review nutrition when at higher pace and start the run easy. So far, so good. The big question though is, will this improvement be enough to shave nearly 40 minutes from my last Ironman to come under 11 hours of racing? This is the challenge I have given to myself.